DISCOVER A BETTER WAY TO PAY FOR COLLEGE! The Credit Union Student Choice private loan solution can help you fill the funding gaps that federal aid may leave behind. With low rates and fewer fees, including no origination fee, you could save hundreds of dollars per year by choosing Student Choice as opposed to an “alternative lender”. Mountain Laurel Federal Credit Union exists for a single purpose – to serve our members and help them build strong financial futures. We fully understand that a college education is often a part of that future, and we’re here to help. As a not-for-profit financial cooperative, our Credit Union is proud to offer better rates and lower fees than our competitors. 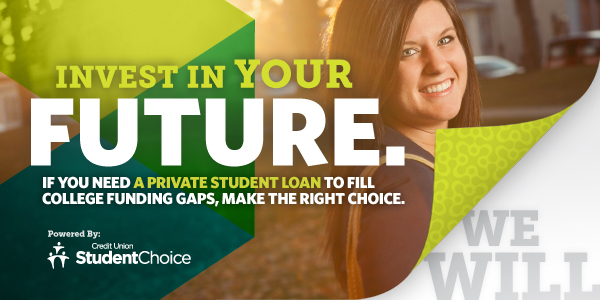 Our Student Choice Website is the best way to apply for this loan. Our Student Choice Website is also a great place to learn more about the product, including rate information, calculators and budgeting tools. If you are not already a member and you live, work, worship, or go to school in Elk, Cameron, McKean or Warren County, PA, you are eligible to join. We encourage you to call us or stop in to any one of our seven convenient locations so you can begin taking advantage of Student Choice and the many products and services we have to offer. Click here to visit our Student Choice Website or to apply for a Student Choice loan today. Include: Student Choice account number & Members name on check.